Congratulations to the 65 driven and determined triathletes (out of 2244 finishers; see our Results Analysis) who qualified for Kona at the 2011 Ironman Wisconsin. 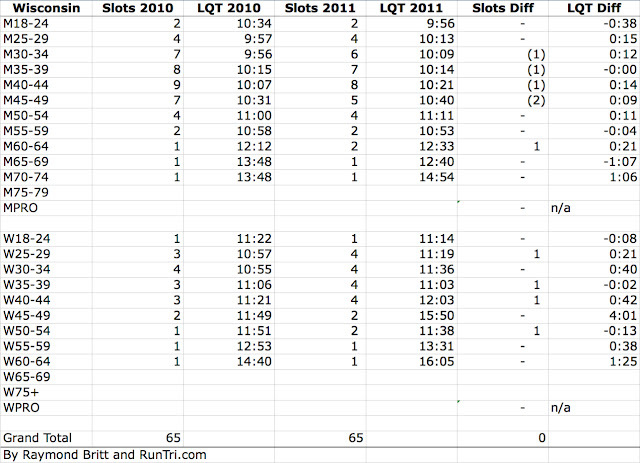 Generally, we expect Kona qualifying times to be faster compared to the previous year, but there were some surprises. Additionally, 4 slots were moved from male age groups to the women's side, which would normally suggest that with fewer slots, in M30 to M45 last qualifying times (LQT) would be significantly faster. Not necessarily so. In fact the last qualifying time in only 5 age groups was faster, compared to 2010. 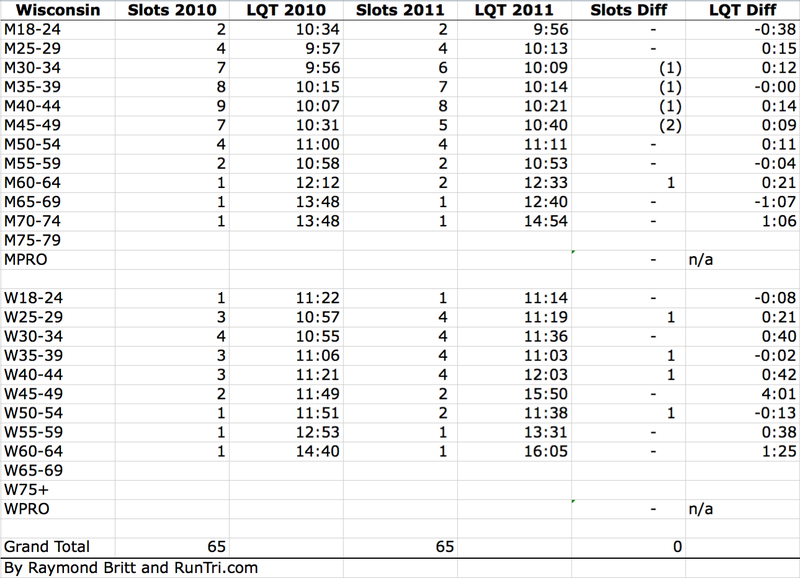 And in the age groups that lost slots, the last qualifying times were actually slower than in 2010. Heat that led to a 13:24 average finish time for all athletes may have something to do with it, but wouldn't account for so many slower times. Could the field have been weaker this year? Could the trend toward fewer and fewer slots per race be discouraging more triathletes from training hard enough to qualify? Time will tell as the 2012 qualifying season continues.